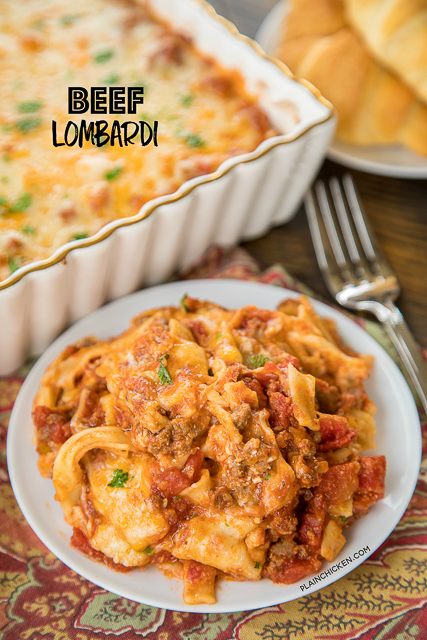 This Beef Lombardi Casserole isn't fancy; it is just really good! 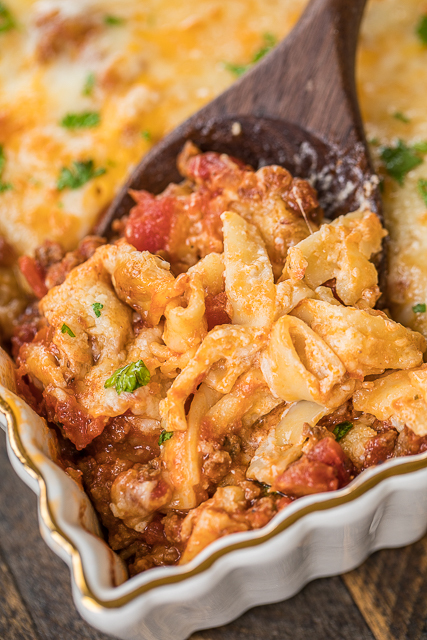 Ground beef, tomatoes, noodles and cheese. How could it be bad?!?!?! You will LOVE it!! It is great to make ahead and can even be frozen for up to a month. Woohoo! High five for easy weeknight meals. 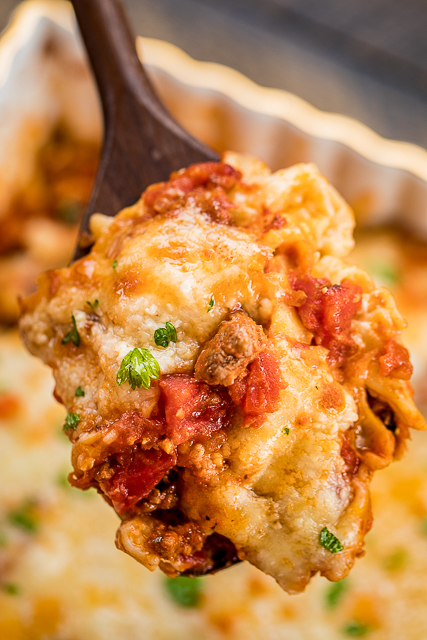 This Beef Lombardi Casserole is very simple to make. Just brown the meat, boil the noodles and toss everything together. 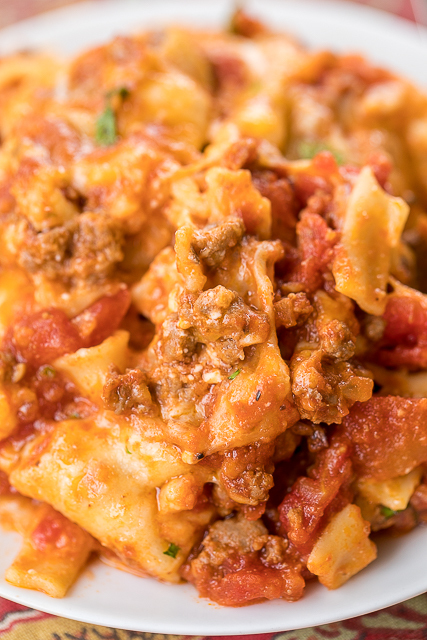 We loved the creamy noodles and the hearty meat sauce. There is a little kick to the sauce from the diced tomatoes and green chiles. If you are worried about the heat, just make sure to use a can of MILD diced tomatoes and green chiles. We served this with a simple salad and some crusty bread. SO easy and SOOOOO delicious! Brown ground beef in a large skillet over medium heat. Cook until no longer pink. Drain. Stir in diced tomatoes with juice, diced tomatoes and green chiles with juice, salt, pepper, onion powder, garlic powder and tomato paste. Stir together cooked egg noodles, and sour cream. Spread noodles in bottom of prepared pan. Top with meat sauce. Sprinkle with cheddar, Parmesan and mozzarella cheeses. Cover and bake 35 minutes. Uncover and bake and additional 5 minutes. This sounds wonderful. 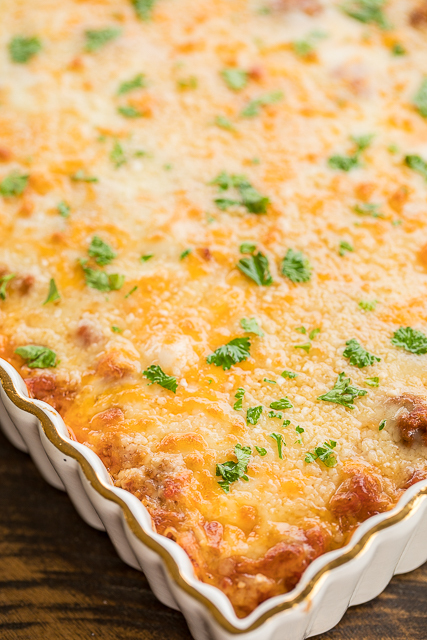 Since there are only the 2 of us I'll freeze 2 small casseroles for later. Except the noodles in your photos don't look like what I would call egg noodles. Some look like ravioli and some look like penne. I am guessing you are about to send out those recipes in the future and are using a conglomeration of photos. Nothing much wrong with that. It's still all about the flavour. ??? I used egg noodles. That is a picture of cooked egg noodles in the casserole. Yet again another delicious looking recipe! I really want to try this in my instant pot. How long do you think? 20 mins? Also, would I add cheese at the end? I’m still an instant pot newbie! Haven't tried this in the instant pot. You will just have to experiment with it. Let us know how it turns out if you try it. Is this recipe supposed to say 6 ounces of egg noodles? I can only seem to find packages of 8, 12, and 16 oz egg noodles. This is a wonderful dish. I did add to it though. I sautéed onion, garlic, bell pepper, carrots, and celery. I always look for ways to add extra veggies. I also add 1t powdered turmeric.